McPherson Cellars has elevated its profile with Pennsylvania consumers since recently starting to sell several of its wines to the Pa. Liquor Control Board for its Fine Wine & Good Spirits Stores. The Lubbock, Texas, producer taps into one of that state's oldest wine families, and it offers a mix of wines that aren't seen much in eastern Pennsylvania, with juice made from Tempranillo, Albarino, Grenache and Pinquepoul Blanc. Per Tom Bratcher, director of sales for Mcpherson Cellars Link, McPherson is located in the Texas High Plains American Viticultural Area (AVA) in Lubbock. "The High Plains is below what they call the Panhandle of Texas and about 65-70 miles from the Texas/New Mexico border and almost 400 miles northwest of the Hill Country," he wrote. "The interesting thing is that 75 to 80 percent of the grapes in Texas are on the High Plains, not in the Hill Country. People want wineries in the Hill Country because of the tourist value, but the best grape-growing area is generally recognized to be the High Plains. The area is a high plateau about 3400 to 3500 feet above sea level so has hot days, cool nights [average 30 degrees between daytime high and night-time low], sandy loam soil and low humidity. There are spots in the Hill Country that do well with grapes but most of the better wineries source some or all of their grapes from the High Plains." Bratcher relayed several questions to winemaker and winery founder Kim McPherson, whose father was a founder and pioneer of today's wine industry in Texas and whose younger brother, Jon, is making wines in the Temecula wine region north of San Diego, Calif., at South Coast Winery & Resort. Here are the questions and Kim's responses. Q, The Piquepoul grape, which you put in your dry white called Picquepoul Blanc. How did it get there and what kind of a future does it have there? A, I requested a grower on the High Plains to plant Piquepoul, which he did, and 2015 was the first production. To my knowledge there is only one other grower that put in Piquepoul in the Hill Country but their production is small. I think it has a good future but probably not as big as most of the other white grapes being grown here, especially Viognier and Roussanne followed by Albarino, Marsanne, Chenin Blanc and Vermentino. With Piquepoul we focus more on restaurants. Sommeliers know Piquepoul but the public does not. Q, I just opened the Les Copains Red, a Cotes-du-Rhone-inspired red blend. Enjoyed it. How long have you been making it and have the grapes and percentages changed much? A, Les Copains Red [The Friends or The Buddies] is part of my Les Copains series - Red, White, Rose - and all three wines are Rhone varietal blends and all are dry. The first vintage of the Red was 2011 and the % of each grape will change to keep the style consistent, vintage to vintage, but it's always made up of the five varietals - Carignane, Mourvedre, Grenache, Cinsault and Syrah. to be full-bodied, as far south as you are. What's your philosophy on full-bodied vs. lighter reds? Tre Colore: A red Rhone blend of three varietals consisting of Carignane and a small % of Viognier with no oak. The third varietal varies year to year but is either Cinsault, Mourvedre, Syrah or Grenache depending on the crush. It's dry but has a great depth of fruit and is often compared to a Beajolais or Cotes du Rhone. I wanted to make one wine that you could enjoy by itself and with food but not dependent on food. Sangiovese: My Dad, "Doc" McPherson, who founded the first winery in Texas since prohibition, was the first to plant Sangiovese in Texas starting in the mid '80s. La Herencia: Tempranillo blend and % of Tempranillo is usually around 75%, remaining varietals are Mourvedre, Grenache, Syrah and Carignane, all of which have corresponding names in Spain. Q, What couple grapes really thrive in Hill Country? How much experimenting has it taken to see what grows well and what isn't that well-suited for your climate? A, In both the Hill Country and the High Plains you'll find Italian, Spanish and Rhone varietals along with Cabernet, Malbec, Merlot, Chardonnay, Sauvignon Blanc, Chenin Blanc, Moscato, probably a few others. If I had to pick two or three that seem popular with Hill Country growers I'd say Tempranillo, Viognier and maybe Mourvedre or Grenache. Q, We have the issue here with so many consumers looking for sweet wines. Are there some general descriptions of the Texas palate? A, No, it's all over the board, but sweet wines sell really well in grocery and package stores. In small Texas winery tasting rooms, I think they sell a lot of sweet wines. I don't make any sweet wines for our distributor but I make one blush wine for my tasting room. It sells OK, but most of the tasting room sales are my dry wines. At Texas wine festivals, Bratcher says people still ask for sweet wines, but the last 10 years or so more people are looking for dry wines. He says when he tells people we don't make sweet wines they say "oh, thank God!" Overall, in Texas, people drink Cabernet, Chardonnay, Merlot, Malbec, Zinfandel, Pinot Grigio, the usual suspects. 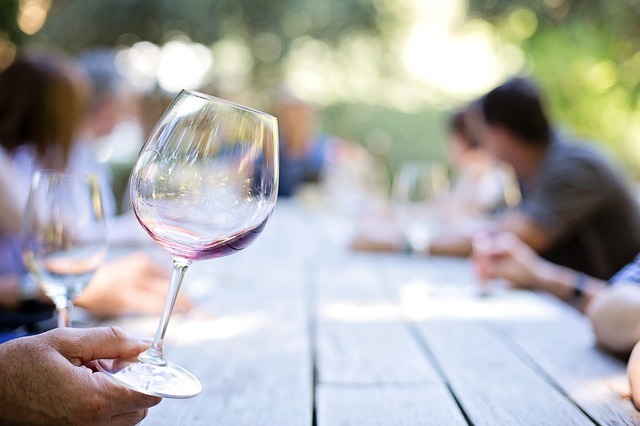 But people who buy Texas wines, and that's growing all the time, recognize and buy Tempranillo, Sangiovese, Viognier and Rhones, particularly blends. Q, Wine has been made and sold in Pa. since 1968, and the industry is still trying to develop a niche and regional/national reputation. Where is Texas in terms of its profile? A, I don't know, we're probably still a long way from Washington and Oregon, but it's a lot better now than even six or seven years ago. Bratcher always says if the first Texas wine a person tastes is a bad one, we all get painted with the same brush, but it's getting better. Now that the Hill Country is such a popular tourist attraction, it's helping to spread the word. Sommeliers in restaurants are putting Texas wines on their list, which helps a lot and retail chains like Total Wine & More have large Texas sections in their stores in Dallas, Austin, San Antonio and now Houston. Q, Anything on the horizon for McPherson? Tearing out or planting anything new? Working on any new blends? A, At McPherson we keep working to expand our out-of-state distribution and I think we're the first Texas winery to get a lot of calls from restaurants around the country. We've been in DC/MD/VA/SC for over three years now and added PA and Chicago in 2016. We hope to be in New Orleans by summer. We're not large enough to be in the average grocery store in Texas so we concentrate on restaurants and the top retail wine stores. As far as grapes, I still get Sangiovese from my late father's vineyard and I work with several growers on the High Plains that grow or plant the varietals I want - Rhone, Spanish and Italian. My younger brother, Jon McPherson, is an award-winning winemaker in Temecula, Calif., and I send my Texas Chenin Blanc cuvee out to him and he finishes my Sparkling Brut for us. No plans to add new varietals but you can tell I like red blends. But I'm always open to something that looks exciting to do on the High Plains.